The Big East Football conference has always been an adding, subtracting, shape-shifting entity. Had it been able to keep its original members, it would be a formidable BCS member rather than constantly trying to reinvent itself. That will leave Rutgers from the original Big East Football conference alignment of 1991. And of course Temple, who rejoined the conference this season. Just this past week, Notre Dame announced plans to leave the Big East for the ACC in all sports except football, in which they'll remain independent. 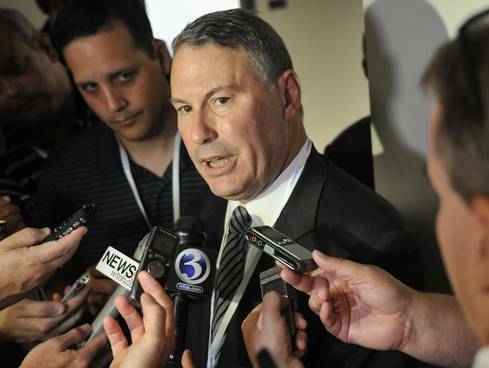 So it's been a crazy week for new commissioner Mike Aresco, a former TV sports bigwig, who just took over a month ago. But a funny thing happened Saturday. In 3 head-to-head matchups between the Big East and ACC, the conference taking the hits delivered them. > Pitt clobbered #13 Virginia Tech 35-17. They held the mighty Hokies to 59 rush yards, and forced 4 turnovers. > UConn won at Maryland 24-21, beating former coach Randy Edsall, who left last year for greener pastures. > #19 Louisville hung on to beat North Carolina 39-34. We'll forget that they led 36-7 and were a goal-to-go situation away from a colossal loss. But the point is The Big East isn't dead, or even broken. Louisville and Cincinnati are teams to reckon with nationally, and we'll see if Rutgers is capable. And they will all enjoy a week of good publicity.